Color, Sharpness, and Focusing upgrade for my Barco Data 808. CRT projectors have been around for decades, and I have been playing with them since high school. To this day, even projectors built in the early 90s still provide the very best performance and longevity for home theaters. My current projector is a Barco Data 808, and it is an incredible machine. It has a few weaknesses compared to the vary top end models, this mod helps address some of them. First, the stock Delta HD 8 lenses are not color filtered. The reason that is a problem is that the color of light the phosphor emits drifts a bit toward yellow when driven hard, especially in the red and green tubes. The brightest reds come out a little orange, and the brightest greens come out a little lime colored. Higher end CRT projectors use red and green filters on those tubes to filter the yellow out and keep the colors as rich and true as possible. It turns out that HD 145 lenses are not only a little sharper, but are color filtered as well, and can be fitted to the 808 with the use of some adapter plates developed by a guy who goes by ‘Joust’ on the interwebs. The second problem is caused by what is called the Scheimpflug Principle (also called lens flapping). The way it applies in a CRT projector is that the lens needs to be coplanar with the screen in order to focus perfectly in all the corners. Higher end projectors have adjustment screws for the lenses that let you correct for the angle of the lens while you are looking at the image. The 808 only has some paper thin washers which require you to remove the lens and swap them out to try to correct the focus. 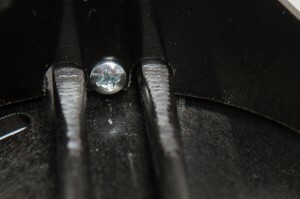 Its a huge pain, and you are hosed if the sweet spot is in between available washer thicknesses. I started with Joust’s plate design, but machined my own out of 3/8 black acrylic. I also added a beefy stainless spring and a nylock nut to each screw to allow me to make adjustments without removing the lens. 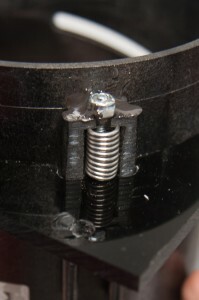 The spring needs to be strong enough to support the entire weight of the lens with only a little compression to make sure the lens will be stable once adjusted. I wish I had before and after pictures, as the difference is remarkable. I used to have to move text to the center of the screen to be able to read it clearly, and the corners always felt just a little fuzzy. After mounting and adjusting the lenses, there is no longer a discernible difference in sharpness across the entire screen, and to my eye (and that of the colorimeter I use to calibrate the projector) the color gamut is far closer to perfect. It looks amazing. Well worth $20 in parts and an afternoon’s work.